Blue Safari Submarines has been in operation in the country of Mauritius since the year 1998. The company was founded by two men originally from France who both had a passion for the sea. Blue Safari started out with just one submarine that could hold up to five passengers. It has now grown into a multi-site company that provides unique attractions for tourists with now two submarines, as well as many underwater scooters. One of the two founders of the thrilling underwater excursions of Blue Safari is Luc Billard, who is a world traveller and an experienced sailor. Billard started sailing he was only eight years of age, and spent a large portion of his childhood surrounded by boats and lakes in France. While at college, he studied economics, earning both a bachelor’s degree and a masters degree. Billard went on afterwards to work in general management and marketing. A love of sailing stayed with Luc Billard, and after finishing his studies, he participated in the 1977/1978 Whitbread Around the World Race, which is now called the Volvo Ocean Race. After having success working in the field of marketing, Billard decided to travel around the world, taking positions in the United States, Malaysia, and Japan before moving in 1995 to Mauritius. He found a permanent home in Mauritius, a place where Billard says people are friendly, the nature is breathtaking, and is surrounded by the beautiful sea. 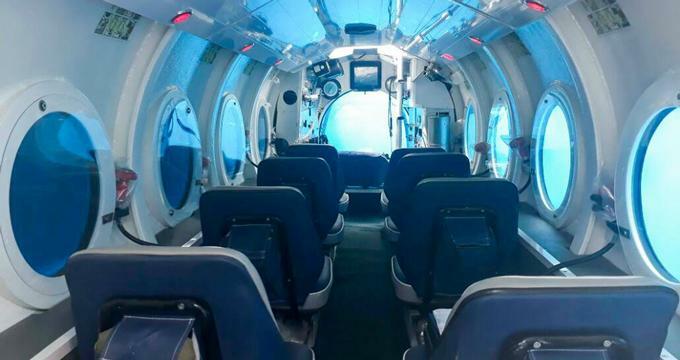 After a couple years of dedicated hard work, Blue Safari Submarines opened to the public, offering tourists with a chance to take an undersea adventure. Only a year and a half later, the company added an addition submarine. In 2005, Blue Safari introduced underwater scooters, providing an even more unique ways to explore the world of the sea from underwater. Today, over three hundred thousand visitors have had the chance to enjoy an underwater experience they won’t soon forget in Mauritius. The standard under-the-sea experience with Blue Safari Submarines is the 35-Metre Dive. The experience takes guests on an amazing underwater, two-hour excursion in the company’s BS1100 submarine, which includes 40mn of dive. The excursion was specifically designed to ensure that every passenger enjoys a great view of the Indian Ocean from many, many meters below the water’s surface. Visitors receive some safety training and a full explanation of what will happen before the underwater adventure begins, which is followed by the memorable journey beneath the water’s surface that lasts around forty minutes. The Subscooter Trip is certainly a unique underwater experience. Guests can choose to ride their subscooter alone or ride with another person, as two people can fit on one of the underwater scooters. Visitors can breathe naturally while underwater through a bubble that offers them with amazing 360-degree views through the glass. During the excursions, guests can watch as numerous colorful fish swim past within the three meters in the Indian Ocean. Participants of the Subscooter Trip travel at a leisurely speed of three kilometers per hour, allowing them to be able to fully take in the marine scenery around them.